For other variants of this aircraft, see Boeing 737, Boeing 737 Next Generation, and Boeing 737 MAX. The Boeing 737 Classic refers to the -300/-400/-500 series of the Boeing 737. It is the second-generation derivative of the 737, following the original -100/-200 models that began production in 1966. They are short- to medium-range, narrow-body jet airliners. Produced by Boeing Commercial Airplanes from 1984 to 2000, the 737 Classic includes three variants and can seat between 145 and 188 passengers. Improvements over the previous generation of 737 aircraft included CFM International CFM56 high-bypass-ratio turbofan engines, upgraded avionics, and increased passenger capacity (in the -300/-400 models). The first model of the Classic series, the 737–300, entered service in 1984. It was followed by a stretched model, the 737-400, which entered service in 1988, followed by the shortened 737-500, the smallest variant in the classic series, in 1990. In total, 1,988 aircraft were delivered. The Classic series was introduced as the new generation of the 737, but following the introduction of the 737 Next Generation in the mid-1990s, was officially designated as the 737 Classic series. Following the success of the Boeing 737-200 Advanced, Boeing wanted to increase capacity and range, incorporating improvements to upgrade the plane to modern specifications, while also retaining commonality with previous 737 variants. Development began in 1979, and in 1980, preliminary aircraft specifications were released at the Farnborough Airshow. The new series featured CFM56 turbofan engines, yielding significant gains in fuel economy and a reduction in noise, but also posing an engineering challenge given the low ground clearance of the 737 - a trait of its 707-derived fuselage. Boeing and engine supplier CFM International solved the problem by placing the engine ahead of (rather than below) the wing, and by moving engine accessories to the sides (rather than the bottom) of the engine pod, giving the 737 a distinctive noncircular air intake. The wing incorporated a number of changes for improved aerodynamics. The wing tip was extended 9 inches (23 cm). The leading-edge slats and trailing-edge flaps were adjusted. The flight deck was improved with the optional electronic flight instrumentation system, and the passenger cabin incorporated improvements similar to those on the Boeing 757. In March 1981, USAir and Southwest Airlines each ordered 10 aircraft of the 737-300 series, with an option for 20 more. That aircraft, the initial model of the 737 Classic series, first flew in February 1984 and entered service in December of that year with Southwest Airlines. A further stretched model, the 737-400, was launched with an order for 25 aircraft with 30 options from Piedmont Airlines in June 1986. That aircraft first flew in February 1988 and entered service later that year with Piedmont Airlines. The final model of the series, the 737-500, was launched with an order for 30 aircraft from Southwest Airlines in May 1987. That aircraft, which was designed as a replacement for the 737-200 and had similar passenger capacity and dimensions, as well as the longest range of any member of the 737 Classic family, first flew in June 1989 and entered service with Southwest Airlines in 1990. Boeing selected the CFM56-3 exclusively to power the 737-300 variant. The 737 wings were closer to the ground than previous applications for the CFM56, necessitating several modifications to the engine. The fan diameter was reduced, which reduced the bypass ratio, and the engine accessory gearbox was moved from the bottom of the engine (the 6 o'clock position) to the 9 o'clock position, giving the engine nacelle its distinctive flat-bottomed shape, which is often nicknamed the "hamster pouch". The overall thrust was also reduced, from 24,000 to 20,000 lbf (107 to 89 kN), mostly due to the reduction in bypass ratio. Throughout the 1980s, the 737 Classic series attracted large orders from airlines in the United States and Europe, with its order totals exceeding those of preceding 737 models. By far, the most successful model was the 737-300, with deliveries totaling 1,113 aircraft (the 737-400 and -500 reached 486 and 389 deliveries, respectively). Major operators included US carriers, small national airlines, and charter carriers. By the 1990s, when regular Boeing customer United Airlines bought the Airbus A320, this prompted Boeing to update the slower, shorter-range 737 Classic -400 into the rewinged, updated, more efficient, longer 737NG-800. Production of the 737 Classic continued alongside that of the Next Generation for a period of time; the first 737-700 was completed in December 1996; the last 737 Classic was completed in February 2000. Six former Southwest 737-300s are modified and operated for aerial firefighting by British Columbia-based Coulson Group, supported by a C$3.4 million ($2.6 million) loan from the Canadian government. The converted 737 FireLiner can carry 4,000 US gal (15 m3) with a flow rate of 3,000 US gal (11 m3)/s, and retains 66 seats. The first was completed in 2018 and deployed to Australia. The prototype of the -300 rolled out of the Renton plant on January 17, 1984, and first flew on February 24, 1984. After it received its flight certification on November 14, 1984, USAir received the first aircraft on November 28. A very popular aircraft, Boeing received 252 orders for it in 1985, and over 1,000 throughout its production. The 300 series remained in production until 1999 when the last aircraft was delivered to Air New Zealand on December 17, 1999, registration ZK-NGJ. By then, 1,113 Boeing 737-300s were produced in a span of more than 15 years. In December 2008, Southwest Airlines selected Boeing to retrofit the 737-300 with a new set of instruments, hardware, and software, to improve commonality with the 737-700, as well as to support the Required Navigation Performance initiative, but that order was later cancelled and the retrofits never took place. The 737-300 can be retrofitted with Aviation Partners Boeing winglets. The 737-300 retrofitted with winglets is designated the -300SP (Special Performance). Used passenger -300 aircraft have also been converted to freighter versions. The 737-300 has been replaced by the 737-700 in the Boeing 737 Next Generation family. The 737-400 design was launched in 1985 to fill the gap between the 737-300 and the 757-200, and competed with the Airbus A320 and McDonnell Douglas MD-80. 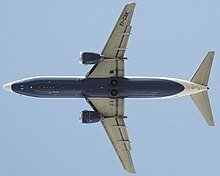 It stretched the 737-300 another 10 ft (3.05 m) to carry up to 188 passengers. It included a tail bumper to prevent tailscrapes during take-off (an early issue with the 757), and a strengthened wing spar. The prototype rolled out on January 26, 1988, and flew for the first time on February 19, 1988. The aircraft entered service on September 15, 1988, with launch customer Piedmont Airlines (25 aircraft ordered). The 737-400F was not a model delivered by Boeing, but a 737-400 converted to freighter. The Boeing 737-400 never included winglets as an option, just like the Boeing 737-600. Alaska Airlines was the first to convert one of their 400s from regular service to an aircraft with the ability to handle 10 pallets. The airline has also converted five more into fixed combi aircraft for half passenger and freight. These 737-400 Combi aircraft were retired in 2017 and replaced with 737-700Fs. In November 2018, VX Capital launched an ABS secured on 35 B737-400 freighters valued at $250 million (an average of $7.1 million), to be leased for $100,000 per month each. The last Boeing 737-400, what was known as the last Classic series of the Boeing 737, OK-FGS, MSN 28478, L/N 3132) was delivered to CSA Czech Airlines on February 25, 2000. The 737-400 was replaced by the 737-800 in the Boeing 737 Next Generation family. The -500 series was offered, due to customer demand, as a modern and direct replacement of the 737-200, incorporating the improvements of the 737 Classic series in a model that allowed longer routes with fewer passengers to be more economical than with the 737-300. The fuselage length of the -500 is 1 ft 7 in (48 cm) longer than the 737-200, accommodating up to 140 passengers. Both glass and older style mechanical cockpits arrangements were available. Using the CFM56-3 engine also gave a 25% increase in fuel efficiency over the older -200s P&W engines. The 737-500 was launched in 1987, by Southwest Airlines, with an order for 20 aircraft, and flew for the first time on June 30, 1989. A single prototype flew 375 hours for the certification process, and on February 28, 1990 Southwest Airlines received the first delivery. The 737-500 has become a favorite of some Russian airlines, with Nordavia, Rossiya Airlines, S7 Airlines, Sky Express, Transaero, UTair, and Yamal Airlines all buying second-hand models of the aircraft to replace aging Soviet-built aircraft and/or expand their fleets. Aerolíneas Argentinas replaced its 737-200s with second-hand 737-500s. The 737-500 is now replaced by the 737-600 in the Boeing 737 Next Generation family. However, unlike the 737-500, the 737-600 has been a slow seller for Boeing since its introduction, with only 69 aircraft delivered. As the retirement of all 737 Classic models has accelerated, with retirement of 300s and -500s climbing 40% in 2012, the 737-500 has fared worse because of its smaller size. Aircraft older than 21 years old are being retired (vs. at least 24 years old for the 737-300). While a few 737-300s are slated for freighter conversion, no demand at all exists for a -500 freighter conversion. On September 5, 2016, Southwest Airlines flew their last 737-500 revenue flight, Flight 377 from El Paso to Dallas. As of July 2018, 738 Boeing 737 Classic aircraft were in commercial service. This includes 309 -300s, 273 -400s, and 156 -500s. Brazil, Chile, China. Colombia, India, Indonesia, Kuwait, Mexico, Niger, Peru, Philippines, South Korea, Taiwan, Thailand, United Arab Emirates, Venezuela. Boeing 737-400 G-DOCB, formerly operated by British Airways, receives a water salute after landing at Cranfield University for preservation. N759BA, an ex-China Southern Airlines 737-300 formerly registered B-2921, is on display at the Pima Air & Space Museum in Tucson, Arizona. N300SW, Southwest Airlines' first 737-300 delivered in November 1984, is displayed at the Frontiers of Flight Museum at Love Field in Dallas, Texas. G-DOCB, an ex-British Airways 737-400 is on display at Cranfield University's airport in the United Kingdom, where it is currently in use by the university for crew education. As of December 2017[update], 62 hull losses of Boeing 737 Classic series aircraft have occurred, with a total of 1,176 fatalities. An analysis by Boeing on commercial jet airplane accidents in the period 1959–2013 showed that the classic series had a hull loss rate of 0.54 per million departures versus 0.27 for the Next Generation series and 1.75 for the original series. 140@32" - 149@30" 159@32" - 168@30" 122@32" - 132@30"
^ a b c d e Endres, 2001, p. 129. ^ Shaw, 1999, pg. 7. ^ a b Endres, 2001, p.128. ^ Epstein, N (1981). "CFM56-3 High By-Pass Technology for Single Aisle Twins". 1981 AIAA/SAE/ASCE/ATRIF/TRB International Air Transportation Conference, May 26-28, 1981, Atlantic City, New Jersey. AIAA-1981-0808. ^ Graham Warwick (Oct 19, 2018). "First Boeing 737 FireLiner Deploys To Fight Australian Wildfires". Aviation Week & Space Technology. ^ Shaw, 1999, p. 10. ^ "Boeing Press Release". Boeing.com. December 22, 2008. Archived from the original on April 26, 2011. Retrieved March 20, 2011. ^ a b "FAA Type Certificate Data Sheet" (PDF). Rgl.faa.gov. Retrieved 23 January 2019. ^ Shaw, 1999, p. 13. ^ "Boeing 737-400 Freighter". Aircraft Information. Alaska Airlines. Retrieved June 29, 2011. ^ "The end of an era: Alaska retires unique cargo-passenger 'combi' planes". Alaska Airlines Blog. 2017-10-16. Retrieved 2018-07-26. ^ Aircraft Value News (November 26, 2018). "VX Capital Takes Advantage of Strong B737 Freighter Values". ^ a b c d Shaw, 1999, pg 14. ^ Shaw, 1999, pg 40. ^ "Southwest Retires Final Boeing 737-500s - Airways Magazine". Airwaysmag.com. September 7, 2016. ^ "737 Model Summary". Active.boeing.com. Retrieved 23 January 2019. ^ Hechanova, Maria (November 5, 2013). "'Most popular jetliner' added to Pima Air and Space Museum". Tucsonnewsnow.com. KOLD-TV. Retrieved May 22, 2014. ^ "N759BA Boeing Capital Corporation (BCC) Boeing 737-3Q8 - cn 27286 / ln 2528". Planespotters.net. Archived from the original on May 22, 2014. Retrieved May 22, 2014. ^ "Which University in England has a Boeing 737-400 on site?". TravelUpdate. 7 October 2017. Retrieved 23 January 2019. ^ "Boeing 737-300 Statistics". Aviation Safety Network. December 31, 2017. ^ "Boeing 737-400 Statistics". Aviation Safety Network. December 31, 2017. ^ "Boeing 737-500 Statistics". Aviation Safety Network. December 31, 2017. ^ "Statistical Summary of Commercial Jet Airplane Accidents – Accident Rates by Airplane Type" (PDF). Boeing.com. August 2014. p. 19. ^ "737-300/-400/-500" (PDF). startup. Boeing. 2007. ^ a b Butterworth-Heinemann (2001). "Civil jet aircraft design". Elsevier. Boeing Aircraft. ^ a b "Type Certificate data sheet No. A16WE" (PDF). FAA. June 3, 2016. "737 classic" (PDF). Boeing. 2007.